Skechers Performance has released the new GOmeb Razor and the updated GOrun 5. So what are the technical differences between these two shoes? the GOrun 5 upper uses a circular knit GOKnit for a sock like fit while the GOmeb Razor uses a more supportive flat knit GOKnit material to get that secure fit Meb prefers. I briefly ran in both shoes and found the Razor firmer with a looser heel hold. 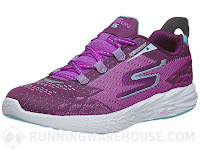 The GOrun 5 had a less supportive yet very comfortable foot hold and seemed a touch pointier both likely due to the less structured circular knit upper. Let's hear what Peter and Patrick thought. Peter is a sub 3 hour marathon Masters runner. Patrick is a 19 year old ultra runner who had the 9th fastest US 100 mile time of 2016, 14:51. He was also the 1st finisher under 20 years of age at the 2016 Boston Marathon(2:46) along with winning several other 2016 ultras wins. Aha, this is the goldilocks shoe from Skechers!!! First run in this shoe suggests that it’s exactly what the earlier shoes suggested was possible. I liked the GoRun series, but found it to be slightly too little shoe—sometimes a little too soft and too flexible. 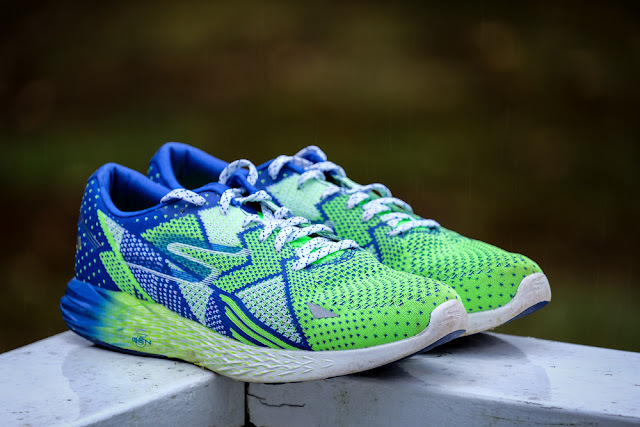 The GoSpeed was just a little too stiff for my preferences (I know, I know they work great for Meb and when I can run 4:40’s I may like them better!). The Razor completely nails the space between those two shoes. The Skechers Razor is a super light (7.7 oz for a men’s 9) daily trainer and racer with a heel height of 18mm and forefoot of 14mm. It’s firmer than the GoRun series without feeling at all stiff. I’ve run easy, run long and run fast in them and it has been a joy across all runs. These shoes scream speed right out of the box and their flashy, patterned design is certain to turn some heads. As someone who sticks to low-drop, lightweight shoes, the GOmeb Razor fits right in amongst the rest of my trainers, offering a natural and versatile ride. A really nice update to the GORun series. The upper is slipper-like, super comfortable and fits well. They weigh 7.5 oz (men’s 9) and have the same 18mm/14mm stack height of the Razor. They are a softer ride than the Razor, and are really fun to run in. 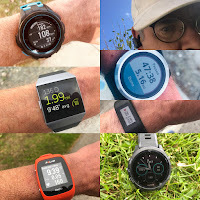 The similarity in the look and specs of the GOrun 5 to the GOmeb Razor is wild, considering how vastly different they feel on the foot and on the run. A snugger, narrower upper makes the GOrun 5 seem more like a racer, although it’s softer midsole would beg to differ. This plush, cushioned feel makes it perfect for longer races, protecting runners from wear and tear while still providing some rebound. Both the Razor and the GoRun5 have GoKnit™ uppers. They both fit true to size and have soft, supportive uppers. The Razor has 6 eyelets (with another to use for lace-lock) while the GoRun5 has only 3 eyelets (also with an extra eyelet up top). This is the major difference in the uppers of these two shoes and has a real effect on the feeling of the shoes. While the GoRun5 feels like a slipper and lightly holds the foot, the Razor is a more traditional lacing and more solidly holds the foot in place. This makes for a more standard running shoe feel, and is a very secure fit. Both shoes seem to have varying densities of knit for breathability and hold. The GoRun5 has a “Quick Fit” feature on the back, which is essentially a pull-tab on the back of the heel to yank the shoe on or off. This is a nice feature for triathlon. The heel counter on the Razor seems a bit more substantial than the counter on the GoRun5. The step in feel of this shoe is great. Featuring a GO KNIT upper, the GOmeb Razor provides a secure yet freeing feel around the foot. The upper material is a bit thicker than the material used on the GOrun 5, likely improving the durability of the shoe. The flexible upper combined with the more natural foot shape (no pointy toe box here!) has meant zero foot issues for me, no matter what the distance (and as a fan of sockless running for practically all my runs, this is definitely something I’m happy about). The heel counter has a “barely there” feel and the width of the heel is about average. The reflective detailing on the upper is a nice touch, making them highly visible in low-light conditions. The GOrun 5 features a GO KNIT upper similar to the GOmeb Razor, but is made of a thinner and softer material. There is also an integrated inner support strap-on either side of the second eyelet. 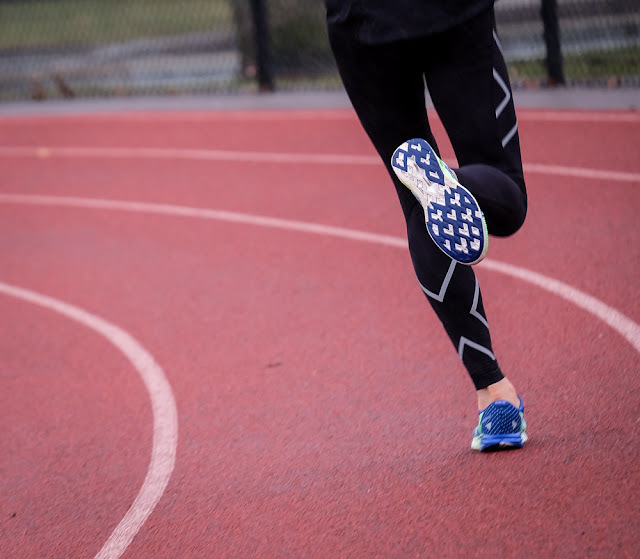 This, combined with a narrower last and lower forefoot volume, gives the shoe a dialed-down fit, like that of a racing flat. The laces do not have as many eyelets as the GOmeb Razor (or your typical shoe), which means they have to be pulled a bit tighter to feel secure. The GOrun 5 also features a narrower heel, which holds the foot nicely. A quick-fit pull tag is also attached allowing for quick on and offs. Sockless runs in the GOrun 5 left me with no worries! 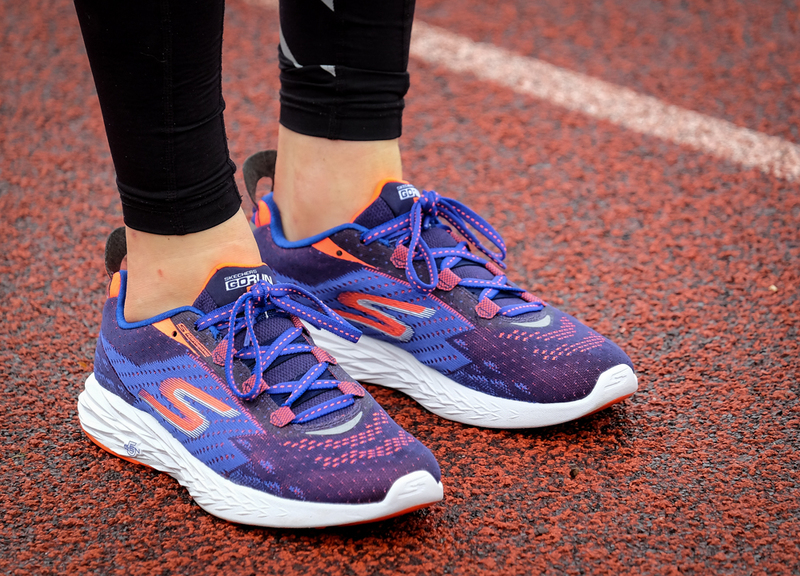 Both the Razor and the GORun 5 feature 5GEN® cushioning for the midsole with a layer of blown rubber covering areas of the mid-foot, forefoot and heel. There’s not a ton of blown rubber underneath, but grip and ride are great. What’s really interesting is that with both shoes featuring the same material, with seemingly the same layout of blown rubber, they ride quite differently. Both shoes have some exposed midsole, and I’m starting to see a little bit of wear around the edges (where there’s no blown rubber). I’m not sure it will be problematic, but I’m keeping an eye on it. GOmeb Razor - The midsole of the GOmeb Razor is made of Skechers 5Gen material. While running they have a firm feel with a bit of pop, but still offer plenty of cushion for longer runs. The GOmeb Razor also features a full ground contact outsole (with a diagonal/diamond pattern), with some additional durable rubber in the heel and forefoot. This really impressed me, as it led to a very smooth ride. The GOmeb Razor is designed to be a more cushioned version of the GOmeb Speed, but still offers plenty of energy return for faster efforts. GOrun 5 - Just like the GOmeb Razor, the midsole of the GOrun 5 utilizes Skechers 5Gen material, although it’s durometer (hardness) is a few notches down. The outsole has the same full ground contact outsole (with a diagonal/diamond pattern), designed to provide grip on a variety of surfaces. GOmeb Razor : The Razor is firmer, has more support through the arch and a ‘snappier’ feel. The relative firmness allows for speedier turnover when you step on the gas. The Razor’s firmness doesn’t prevent it from being well-cushioned and protective of the forefoot. It’s a nice middle-ground and holds up well over long miles. GORun 5: The GoRun5 is a fairly soft shoe. It ALMOST feels like it will bottom out, while never really doing so. On most of my runs so far in the GoRun5, the first mile has felt a little too soft, and all subsequent miles have felt just right. 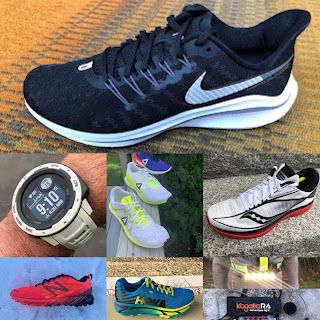 It’s a nice long-run shoe and goes fast if you need it to, but I do feel that you lose a little bit of energy return from the road due to the softness of the forefoot. GOmeb Razor - The GOmeb Razor has a very unique (in a good way!) ride. The snappiness was very apparent, and I found myself looking to pick up the pace while wearing this shoe. The versatility of the shoe is pretty surprising, as I’ve taken this pair with me on a wide range of runs and paces over the past couple weeks. Whether you’re racing or headed out for a casual jaunt around the neighborhood this shoe will live up to your expectations every time. GOrun 5 - The GOmeb Razor and GOrun 5 both come in at around 7.5 ounces, and both have an airy, “barely there” feel on your feet. The ride of the GOrun 5 differs from that of the GOmeb Razor in that it has a softer underfoot, with a bit of bounce to it. The GOrun 5 also features a full ground contact outsole like the GOmeb Razor, making the transition from landing to toeing off very fluid. 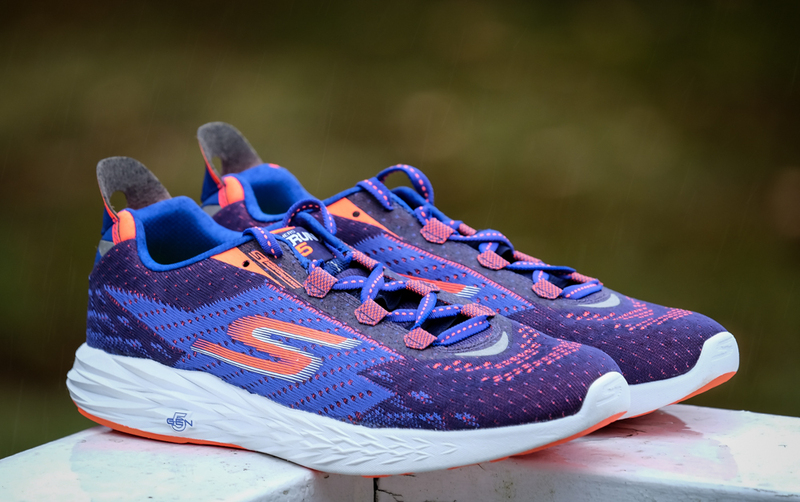 Similar to the GOmeb Razor, the GOrun 5 can be used for a variety of runs, but based off of the fit of the upper, I personally think the GOrun 5 is better suited for race day or a hard, uptempo workout. Both of these shoes feel like a significant step forward for Skechers. It’s interesting to try to figure out how two shoes with nearly identical specs feel so different on the road. Ultimately, the Razor feels like a daily trainer/distance racer while I might use the GoRun as more of a recovery and daily trainer. I guess it depends more on the mood I’m in. They’re both terrific shoes. Skechers has dropped the M-Strike and gone to a more typical running shoe tread that’s nearly full-contact. The Razor is one of my favorite shoes at the moment. It’s comfortable, versatile, inexpensive and I can see it being a great pick for runners of all speeds and strengths. While it may be a “training shoe” for Meb, I think it’s probably a good distance racer for most of us mortals. If the Razor didn’t exist I might be a little more excited about the GoRun5. If I had to pick one of them, I’d pick the Razor, but I’m very happy to have both. GOmeb Razor - Impressive to say the least! 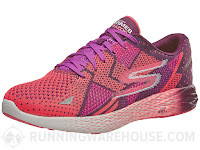 With a thumbs up in the looks department and a performance to match, this shoe confirms my belief that Skechers deserves a place right next to other top running shoe brands. I am excited to see what is to come from the brand in 2017 and beyond. GOrun 5 - A great shoe overall, and an improvement from past iterations of this model, the GOrun 5 is a soft yet fast performance trainer, with a low to the ground, bouncy ride. After testing both models over a couple weeks of high mileage training, I’d also like to point out the durability of these shoes is pretty spectacular. With little noticeable wear on the sole after 50 miles, these shoes have plenty of pop left, feeling practically the same as when they were first taken out of their boxes. These are easily my 3 favorite shoes at the moment. The Nike sits in-between the GoRun and the Razor in terms of firmness and flexibility. I’d be hard pressed to choose between them, so I’ll just highly recommend all 3. The Skechers shoes are more forgiving in the forefoot and the GoRun is equally slipper-ish as the Freedom. I’d go GoRun 5 over the Freedom. GOmeb Razor vs. Nike Pegasus 33. The Razor is lighter and has a slightly more fluid ride than the Pegasus. The GoMeb 3 was too stiff for me. I prefer the Razor. 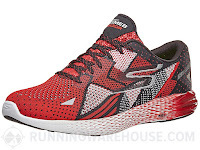 GOmeb Razor / GOrun 5 vs. Altra One 2.5 - My go-to shoe, the Altra One 2.5, has a similar soft feel to that of the GOrun 5, but a more open and natural-shaped forefoot like that of the Razor. The Altra One 2.5 is the lightest of the three shoes, and is zero-drop as opposed to 4mm drop like the Skechers. GOmeb Razor / GOrun 5 vs. Saucony Kinvara 7 - The Saucony Kinvara 7 falls into the same ballpark as the GOmeb Razor and GOrun 5, but more so the GOmeb Razor. All three of these shoes are 4mm drop, and designed to be lightweight, versatile trainers/racers. The Kinvara 7 is the firmest of the three shoes, but the GOmeb Razor feels like it has more pop. The Skechers are a little more flexible and feature more comfortable and smooth engineered-mesh uppers. 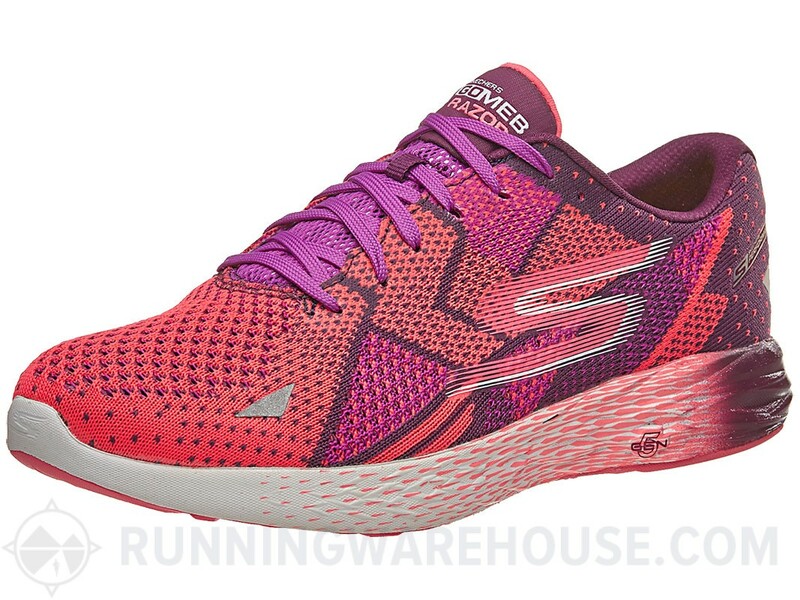 Skechers GOmeb Razor / GOrun 5 vs. Hoka Tracer - The Hoka Tracer is a lighter, much firmer shoe than both the GOmeb Razor and the GOrun 5, but all three feature a 4mm drop, and are great for both speed workouts and long distance races. The GOrun 5 and Tracer have a similar, snug fitting upper to one another, and the GOmeb Razor has a quick, responsive feel like that of the Tracer. -.25 for potential wear of the exposed midsole. -.25 for looks. Skechers are getting better, but I still feel they lag in the design department. The GOrun 5 and GOmeb Razor were provided at no cost. The opinions herein entirely the authors'. How would you guys compare these to the LunarTempo? Both these look fantastic and maybe my first foray into Skechers. Actually the Go Run 5 is pretty similar to the Lunar Tempo in flexibility and feel. I'd say the firmness of the forefoot of the lunar tempo is slightly firmer than the GoRUn 5 and slightly less firm than the Razor. The midsole of these just reminds me of Lunarlon by appearance so makes sense. With the outsole on these, they might make a great light duty trail shoe as that's mainly what I use the LT for currently. Yes, same size in Razor and Peg. The Razor feels pretty stable to me--lighter than the peg, but still holds the foot well under the arch. compared to the Torin, i feel that the Razor is a little smoother in transition, a little snappier. can you compare these, esp. the razor, to the zoom streak 6? notably more cushioned? i'm loving the zoom streak! I tried the GoRun 5 and while I enjoyed the lightweight and soft ride, I felt like it had no "spring" to it. Just felt like I was bottoming out with every stride. Switched to the "new" New Balance Fresh Foam Boracay v3 and while it's about 2 oz heavier, it has the soft ride plus the spring I was looking for. Ryan, I would definitely give the Gomeb Razor a shot, it has the spring and lightness you'd be looking for! Anonymous, to answer your question "what shoe do you recommend for fast series?" I would think you would prefer the GOmeb Razor, since although both shoes have practically the same specs (weight, heel-to-toe drop, etc), the GOmeb Razor has a more responsive ride, which is great for racing or uptempo runs. The GOrun 5 has a softer, more plush feel under the foot. The GOmeb Razor is also probably more similar to the Distance III than the GOrun 5 is. I get confused by the forefoot descriptions of both shoes. The Go run 5 has more stretch in the upper compared to the Razor. In this review it is stated that the Go Run has a smaller last, but I don't see this confirmed elsewhere. My question is simple: I have quite wide feet and I wonder wich shoe will accomodate my feet the best. I have the GR 4 - 2016 and use this one without the provided insole. 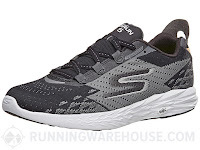 Anonymous, I confirmed with Skechers Performance the fact that the GOrun 5 has a narrower last than the GOmeb Razor. he GOmeb Razor would definitely be better for you if you have wider feet. My size with the kinvara is 9.5 can you estimate the size for the gorun 5..
great review(s), thanks! re heel to toe drop: is there a glued-in insole for 4mm, and a loose pair to make it 8mm? or two loose pairs? what did you use? also, did either of you think about sizing down? i've seen a number of comments elsewhere from people who did--makes me wonder if the sizing is not consistent. As far as I can tell, there's just the insole that comes in the shoe which provides a 4mm drop. You can take it out and run in the shoe without an insole, but I'm not sure if that affects the drop. Would be a question for skechers. On both the razor and the gorun5 I found my normal running shoe size was perfect. I'm not sure that I'd want to size down on either. thanks, peter. interesting, RW says it's supposed to be 4mm with just the glued-in insole, 8mm with the loose insole added. from trying them on and running a little, for me it felt more like 0 drop with just the glued-in, and about 4 with the addition of the loose insole. apparently, that's how it felt for you too. To answer your question on sizing down, I have heard the same comments, including from a Skechers Territory Sales Manager who I run with. I think it depends on the individual - I stuck with my usual size, and the fit felt great. I appreciate any extra space and more open toebox for the longer distances I've been running in them. 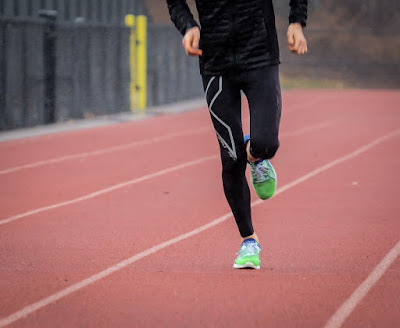 If you are doing more shorter, speed work or races with frequent turns, sizing down half a size might be better. I'd air on the side of sticking with your usual shoe size though. Hope this helps!